Since I had but one RP-related goal this week (getting the Abyss back in shape), I can safely say it’s been a good week! While there are still cosmetic updates to be made, the room is pretty much functional right now. Drawing can now resume! 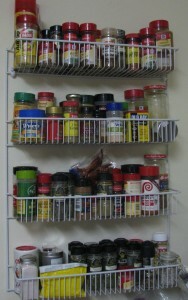 In sorta-related news, I just finished organizing our spice rack. At the old house we had a series of 3 drawers next to the range that were perfect for storing and accessing spices mid-recipe. That’s one of many features that is no longer a facet of our lives, post-move, and the cabinet, counter and drawer-space is precious, now. We do, however, have some unadorned walls that can be put to use and picked up a rack that’s meant to hold canned goods and have put it to use for our spices. It doesn’t hold everything (the bulk spices are still stored in a lower cabinet until I can find jars for them and fit them into the racks, plus we have a counter-top revolving spice rack that is still in use) but it’s close and it’s just behind the main cooking area. Having them nearly alphabetized will help us find what we need that much quicker. Now, for those of you wondering: no, you won’t need a spice collection this huge to make the recipes in What to Feed Your Raiding Party. In fact, you might not even need a third of them! Having a lot of flavor options, though, makes for easy experimentation. Tarragon and marjoram and things a lot of folks don’t keep around, but if you enjoy chicken salads and want to switch things up a bit, try these for a fun change. Rosemary I prefer to buy fresh, as needed, since the dried version turns into little needles that just don’t make for pleasant eating. I also keep chili powder and red pepper flakes on hand for adding color and spice to any dish. I need one of those over the door hanging things…my spices are in a cabinet and to find the one that I need…I have to take almost all of them out. Getting them at eye level and easy-to-access has been the best thing we’ve done to the kitchen so far!